At 177 feet high, South Falls is the most popular waterfall in the park. 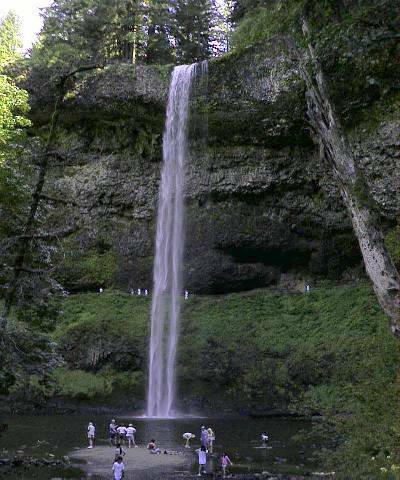 Although it is the largest of the Silver Creek Falls, Double Falls is one foot higher at 178 feet. Some argue the point that Double Falls is just that, two falls and thus should not be counted as one for height purposes. Located a short quarter mile from the main parking lot, South Falls has a paved trail which forms a short loop. The loop is moderately steep in places and has a few switchbacks to and from the falls. As you hike along the trail you will travel behind the waterfall for a spectactual view, be prepared to get a little damp. When you reach the bottom you will cross the bridge from which this picture was taken. You will find a nice pool to take a dip in if you brought your swimming outfits. From here you can take the trail to Lower South Falls or make the short assent back to the picnic and headquarters area. Dogs are not allowed on this trail.